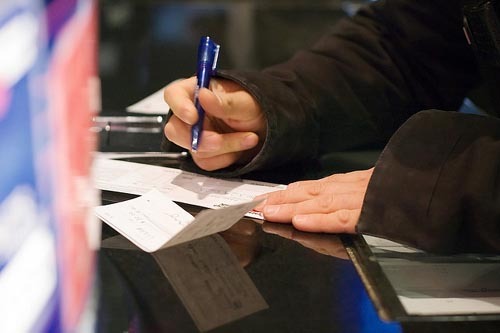 THE majority of British consumers want to retain the cheque as a method of payment, according to new research. Two thirds (66%) of consumers believe that banks should be forced to continue to offer customers the option of having a chequebook. But many consumers seem keener on having the option of using cheques than they are on actually making use of the service. The research also showed that 21% of the population have never even written a cheque and, in total, less than half (45%) have paid for anything by cheque within the last few months. Predictably, there’s a strong link between age and cheque use: some 52% of under-25s have never used a cheque, and a further quarter (25%) haven’t paid for anything by cheque within the last few months. Toby Clark, Head of Financial Services at Mintel, the company which carried out the researh, said: “There’s a strong conservative streak among the British public, as confirmed by the outcry and subsequent climbdown when banks tried to withdraw support for chequebooks. But offering cheques costs banks money, and in the end, that costs all of us money. If people had to pay a little extra if they wanted to have the option of writing a cheque, I’m not sure that they’d still be as set on keeping that service going. One of the reasons for people’s conservatism is an understandable fear that new payment methods could leads to greater levels of fraud. While three fifths (57%) agree that they are worried about payment fraud, only a minority (31%) have actually been a victim of any kind of payment fraud at any point in the last five years. Individually, the most common type of loss is card fraud. Some 14% say that they have been a victim of this kind of theft. It’s not just new payment technology that comes with security risks, though. When thefts of cash and losses as a result of being passed forged notes or coins are combined, the proportion of consumers who have been victims rivals that of card fraud – 8% have had cash stolen, and 5% have lost money thanks to forgery. “The issue of payment fraud is absolutely central when it comes to convincing consumers to adopt new payment methods. Understandably, people are wary of any change to the status quo, but consumers’ fears are not always grounded in reality. Notional threats associated with newer technology are often overplayed, while people are prepared to overlook very real security flaws in established payment technologies. But rational or not, these fears must be countered if new payment technology is to thrive,” Toby concluded. The real story here is that a massive ONE THIRD of people have been defrauded in the past few years. That’s an incredibly high number. People are rightly worried about fraud but the banks don’t seem to be able to address those issues yet.